In this week's mailbag, you asked about swapping coaches, pressure, running back committees and more. Brandon Vogel, Greg Smith and Derek Peterson answered. DP: It’s different kinds of pressure. Immediate pressure? I don’t think it’s even close, it’s Heupel. Part of the allure of Nebraska from a purely coaching perspective had to be the timetable in place and relatively long leash to fix things. Central Florida on the other hand recently kicked off its Heisman campaign for quarterback McKenzie Milton (I hate the hashtag) and that really tells you all you need to know about the expectations heading into the season. If they don’t win something close to nine games they’ll catch a ton of flack on a national scale for what happened this offseason and 2017 will look a lot more flukey in the public’s eye than it should. Also working against Heupel is Frost potentially having immediate success. That just raises his expectation floor even higher. But long-term pressure? Undoubtedly Frost. This is Heupel’s first head coaching gig, people won’t be shocked if it doesn’t work out in the long run. But Frost not only has the rebirth of a proud program to worry about, we’re also getting into a bit of legacy. If this doesn’t work out it impacts the perception of Nebraska as a program moving forward, it impacts the perception of Frost as a coach going forward and it could delegitimize (a bit) what he accomplished at his last stop. BV: Frost. If Heupel doesn’t work out at UCF the school goes out and finds the next up-and-comer and there should still be good interest in that job for those type of candidates because of the location. If Heupel fails at UCF it doesn’t drastically alter the standing or trajectory of that program. I’m not sure I can say the same if Frost weren’t to work out at Nebraska. That becomes a narrative of, “well, if he can’t do it who can?” Whether that perception is fair or not, I think those are the stakes in Lincoln. DP: At Oregon, yes, Frost had a history of riding one guy but that is almost exclusively because of Royce Freeman. From 2013 to 2015 (Frost’s time calling the plays), a single running back had 20 carries or more 17 times. Freeman owned 14 of those games. But at Central Florida there was no trace of that. In two years there, the most carries any non-quarterback got in a game was 17. That was Jawon Hamilton as a senior in 2016. The most by a non-quarterback last season was 16 from Adrian Killings. Held mentioned this summer they’ll ride the hot hand in games, but I would be shocked if we see a back that consistently gets 25-plus carries a game. I’ve long-maintained Greg Bell will be special, but their plan of attack is having their guys fresh in the fourth quarter when the other team is worn down. In reality, they also just have too many mouths to feed. BV: I’m a big fan of coach Neal Brown, so I’m going to give the Trojans the benefit of the doubt here a little bit. Realistically I think you’re looking at a division record between 1-6 and 3-4. I’d take Troy to beat Illinois most of the time if the 2018 teams played 100 times. The Trojans also could beat 2018 Minnesota, Nebraska, Northwestern and Purdue in a one-game setting (particularly when you consider Troy would get some of those games at home). Iowa’s a little less likely for a Troy upset than that last group this year (though the Hawkeyes’ tendency to play pretty close scares me in this scenario) and I don’t think the Trojans beat 2018 Wisconsin. So give Troy a win over the Illini and two of the “middle four”. For a program with a good coach, established culture and recent history of winning I think that’s reasonable with a slight shade towards optimistic. If you were to just power rank the Trojans among the West, however, they probably end up in the bottom two most places. DP: I don’t think either is a game Nebraska necessarily needs to win, but if I had to pick between the two I’d say Michigan because of what it could do in terms of momentum for the program. Part of that has to do with how the schedule works out. Michigan is an offseason darling right now; Shea Patterson has Heisman hype, Harbaugh’s failings seem like they’re being overlooked a bit and Michigan is probably going into that Sept. 22 meeting pretty highly-regarded. 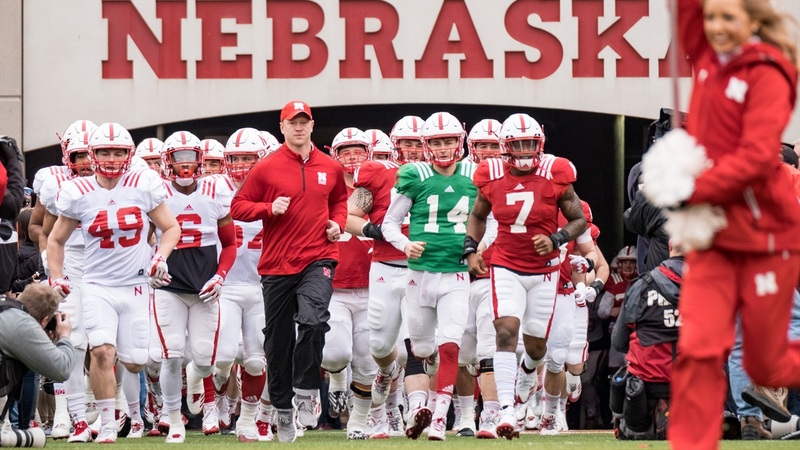 If Nebraska wins that game, the odds of them being either 4-0 or 3-1 are pretty high; national coverage picks up, recruiting perks up, chests puff out a bit inside the program and there will be some seriously good vibes around the team. I don’t think any of that stuff happens if they beat Michigan State. Especially if they’ve gone, say, 2-3 during the pretty rough five-game stretch leading up to it. BV: I’ll take Michigan State based simply on when and where it happens. I’m not as high on the Spartans as most are this season, but they’ll still be a tough opponent. That being the case, as a “progress report” for Nebraska in Year 1 of this new regime, I think it’s a more meaningful measurement near the end of the regular season rather than closer to the start. Plus, it’s always important to win at home. Restoring a true home field advantage is going to be an important part of Frost’s tenure. GS: I’m going to pick Michigan here. Presumably, that means you have started the season 4-0. That means you’d likely beat Purdue, setting up a monster early undefeated matchup with Wisconsin. If Nebraska went on the road and beat Michigan with a freshman quarterback, it would make noise around the country. It could also be a huge shot in the arm confidence-wise for a team that has seriously lacked swag on the field recently. I really like Brandon’s point about establishing a home field advantage again but I think the Michigan game does more for you. BV: I want to take Ken Niumatalolo, but I wonder if his system/style isn’t particularly suited for success at Navy. That being the case, and because there were no restrictions placed on us, I’ll take that plucky talent-maximizer Urban Meyer. (Yes, he’s on the overachiever side of the ledger.) For the underperforming coach, give me Matt Rhule. It’s still early enough in his tenure that his numbers are perhaps misleading at this stage, I think Baylor’s going to be a lot better this year and I have a bias for anyone affiliated with Temple. I haven’t seen everyone else’s picks yet, but I declare these the best. DP: Bill Snyder feels like the penultimate overachiever just because of how tough it is to win at Kansas State. He’s just so good at squeezing every last drop of potential out of his team that he can. I mean, come on, there’s no reason Kansas State should have eight or more wins in six of the last seven seasons playing the style they play in the conference they play it in. Over the same time, recruiting class rankings have been 51st, 73rd, 64th, 49th, 54th, 72nd and 61st. They’ve cracked the top-10 three times and finished inside the top-20 in the final AP rankings three times. For underachiever, I’ll stay in the Big 12 and say Texas Tech’s Kliff Kingsbury. Since he got to Lubbock, the Red Raiders have had the following offenses ranked nationally by offensive S&P+: 28th (2013), 19th, 1st, 4th, 25th (2017). They’ve never been outside the top-30 in success rate. That the Red Raiders’ most successful season under Kingsbury is an 8-5 2013 campaign that culminated in a Holiday Bowl victory over an Arizona State team that didn’t want to be there is, quite frankly, a joke. The defense shouldn’t be bad enough to the point where the No. 1 offense in the country produces a 7-6 record like it did in 2015. BV: Hmm, from a most-interesting perspective I might go with a Dantonio/Ferentz swap. I think Dantonio’s brand of football plays well in the West and he’d make Iowa more consistently dangerous than it already is. Michigan State gets shorted here by getting a lesser version of Dantonio, but them’s the breaks. For entertainment value, clearly you swap Harbaugh and Meyer. I bet Harbaugh would still coach the Buckeyes in his Michigan hat.